My research told me that I needed to bring Lucy’s health and rabies shot records, $30 to pay the Canadian fee crossing into Canada, and her food in its original bag so that the ingredients could be easily determined. What actually happened is that I was not asked about the dog at all. No fee collected. No need to show health papers. No search to determine food ingredients. Most of the border agents’ questions were regarding weapons, which I did not bring. I didn’t even bring my golf clubs or a fishing rod. We enjoyed unremarkable crossings. I made most of our hotel arrangements well ahead of our trip. I searched for pet-friendly hotels, and Best Western made it easy with most locations listed as such. I also used BringFido.com, through which I found a boutique hotel, the Old Stone Inn, in Niagara Falls, Ontario for our first night. I highly recommend The Old Stone Inn in Niagara Falls, on the Canadian side. Lucy was warmly welcomed with a special gift of a travel dog dish, treats, and souvenir door hanger. The room was large and the beds were deemed “the most comfortable ever” by my son. We were allowed to leave Lucy in the room – I had brought her crate – while we walked around the falls. We ate a delicious supper of burgers and local brews from the hotel’s pub in the attractive courtyard. The hotel’s location was ideal: just a short walk down a wooded path to the falls. The hotel was charming and the staff was friendly. We were off to a great start! After a long day of driving, we made it to Indiana, where I had made a reservation in a Best Western just off of I-80 near Chicago. Pet-friendly meant something else here. Upon arrival, I was asked to sign a pet agreement, part of which was to have our room inspected by a maid before we were allowed to check out. Dogs were not supposed to be left alone in the room, but when I said I had a crate, they didn’t press the point. We were tired and didn’t want to leave the room that evening anyway. Where would we go? Instead, we devoured a delivered pizza and enjoyed local brews from the hotel bar. We could hear another small dog barking all evening and into the night (wonder if the dog was left in the room alone?) but luckily Lucy did not bark in return. The maid was afraid of Lucy, but we passed inspection. After several days staying at my mom’s house, we were back in the car headed to Sturgeon Bay, in Door County, Wisconsin and another Best Western to meet up with my dad and step-mom. Again, I was presented with the dog agreement at check-in, but this time the staff person was adamant that I do not leave the dog in the room alone, under any circumstances – not even to go to breakfast, which was included in our room fee. No maid inspection requirement at this property, however. I was flustered and frustrated. My dad and step-mom were staying in the same hotel – that was the point. We planned to stay three nights. I was not told of the pet policy details when I made my reservations through the Best Western central reservation toll-free number, and I didn’t know what to ask at the time. But not being able to leave Lucy for a few hours was not going to work with the activities my family wanted to do. Add to that, we were assigned a room right next to the pool and the breakfast room. Bacon smells, kid noise, and water splashing sounds and they expect my golden retriever to not bark?! I canceled the last two nights and plugged in my computer to find another hotel. Using the pet-friendly filter at Expedia.com, I found a room at The White Birch Inn. The room’s decor was something of a marvel, locked in the late 1980’s-early 1990’s, with mauve carpeting and wallpaper borders. But I would be allowed to leave Lucy in the room if I left my cell number. At check-in, I was given a token for a free drink from the bar. Breakfast was continental, and the first day, I enjoyed a bowl of beautiful fresh berries. The room was large and clean, and the price was right. Lucy in front of one of the many murals in Sudbury, Ontario. The murals are created as part of an annual music and art festival. Our last night of the trip was also in a Best Western in Sudbury, Ontario. The hotel is located on the same street as the police station and across the street from a small park. Again I was given a pet policy form to sign upon arrival, but leaving the dog in our 5th-floor room while we went to breakfast on the first floor was o.k. Or we could go just about anywhere else, as long as no one complained about the dog barking. The desk manager laughed when I told her about the room inspection clause I encountered in Indiana. As Best Westerns are independently owned, she explained, the pet policy (and its enforcement) varies from property to property. Smaller inns will likely have more generous pet policies. It takes a bit more time to comb through search sites and requires a few extra telephone calls to find a good fit. 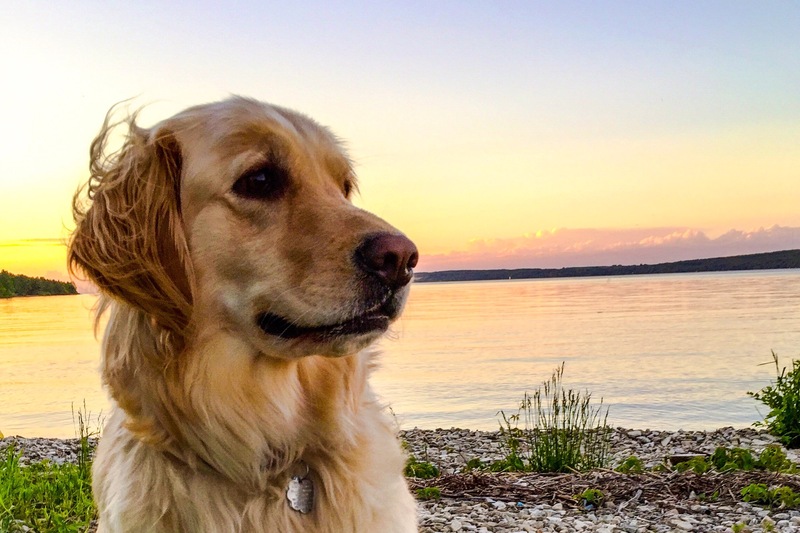 Know what you are going to be doing helps filter, too – the Sturgeon Bay Best Western would have been fine if we had planned to be out all day hiking with Lucy. Be prepared to pay a small additional fee for each pet. Fees were well-disclosed during the reservation process. Some hotels have a size limit for the pet, so pay attention to that detail if you have a large dog. Food & Play Finding dog-friendly casual dining was pretty easy. We found several restaurants that welcomed dogs at their outdoor seating areas. Culver’s, a Wisconsin favorite with locations also in Minnesota and in Michigan, even had water bowls set out for four-legged guests. Try the cheese curds… In Sturgeon Bay, we ate dinner outside on the water at Waterfront Mary’s and Sonny’s. We also enjoyed take-out and either ate in the hotel or sat in a public park that allows dogs. If you go to Door County, Wisconsin, be sure to visit the dog beach at Whitefish Dunes State Park. A day pass cost us $11 for the car, which we paid for at the ranger station. We enjoyed an afternoon on a beautiful, clean, sandy beach on the shores of Lake Michigan. Lucy swam and swam and swam. When visiting a new town, check local community websites to find dog parks and leash laws. The town where my mom lives has a big dog park, Alimagnet Dog Park, with a pond for dog swimming and a walking path. The park is fenced, so dogs are free to be off-leash. Plus, dogs are allowed off leash during the warm months in all of the town’s outdoor hockey rinks with a gate. My mom lives in hockey-crazy Minnesota – a lot of off leash spaces! I want to meet Fudge. Note: The manager at the Sturgeon Bay, WI Best Western did pay me a visit the next morning and offered to let me keep the dog in the room unattended, but it was too late at that point as we were already packing up to go to the White Birch Inn. Images, below: Lucy at Whitefish Dunes State Park; Fire tower in Sturgeon Bay and a view from it; Sturgeon Bay waterfront and drawbridge; white thistle that is rare and specific to the Whitefish Dunes area; Lucy on the dog beach of Lake Michigan; Spoon Bridge and Cherry with Minneapolis skyline; Minnehaha Falls, Minneapolis, Minnesota; Sebastian Joe’s, Minneapolis; chillin’ with my pal Snoops at Valleyfair, Shakopee, Minnesota; Niagara Falls from the Canadian side; and Lucy at Niagara Falls at dawn.